About a decade back during a visit to the world-famous Biscuits & Blues club in San Francisco (which, true to its name, offers up some tasty food as well as music), we picked up a Joe Louis Walker-produced CD compilation entitled Mean Street Blues featuring tracks from some of San Francisco’s top blues talents, including Tommy Castro, Alvin Youngblood Hart, Sista Monica, Lavay Smith & Her Rod Hot Skillet Lickers, and Mark Hummel, to name just a few, with several of the songs (Hart’s and Hummel’s among them) having been recorded during performances at the blues club. Also included in that group was a catchy tune from a local harmonica player named Big Bones, who we had the good fortune of hearing in person at the club a few years later during a birthday celebration for Muddy Waters drummer Francis Clay. Needless to say, the combination of Big Bones and Pena on the Freight and Salvage-set Giant Killers CD makes for one hugely enjoyable recording – in fact, one of our favorites – as they (also joined by Alvin Youngblood Hart on mandolin) roll through such tunes as “Hangin’ Around Foolin’ Around” (the first of the songs we heard from Bones on that San Francisco compilation) and the harmonica-driven, mostly instrumental “Folk Music,” Robert Johnson‘s “Terraplane Blues” and “Hellhound on My Trail,” Lightnin’ Hopkins‘ “Bring Me My Shotgun,” Jimmy Reed‘s “Bright Lights,” Charley Patton‘s “Tom Rushen Blues,” and the Mississippi Sheiks‘ “Sitting on Top of the World.” So we were of course delighted when Bones emailed us recently to let us know that more music from Pena, Big Bones, and Hart is now available on a new CD entitled Paul Pena with Delta by the Bay, from a performance at the Freight and Salvage recorded a year and a half after the show captured on Giant Killers. Although there is a bit of overlap between the songs you’ll hear on the two sets (with “Folk Music,” “Tom Rushen Blues,” “Sitting on Top of the World,” “Swing Low Sweet Cadillac” and Sonny Terry and Brownie McGhee‘s “Hole in the Wall” all found on both CDs), we’re not complaining – all are fine songs and work just as well with the five new tracks on Delta by the Bay as they did on Giant Killers. Things only get better from there, as Pena welcomes Big Bones and Hart to the stage, introducing the set-up as “an instrumentation that used to be used a long time ago, back when the blues were just developing back in the deltas of Mississippi…We’re gonna’ try to present you with the kind of sound they used to get back then without all the scud and everything that you get from an old 78 record,” and then proceeding to do just that with a downright beautiful rendition of Patton’s “Tom Rushen Blues” that features some terrific playing from all. 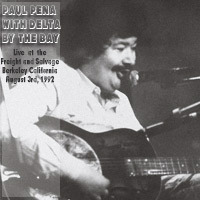 The upbeat, harmonica-driven instrumental “Folk Music” follows, with Bones taking over on lead vocals for several songs, and Pena and Hart providing some nice call-and-response, backing and harmony vocals on tracks like “Hole in the Wall” and one of the most soulful versions of “Sitting on Top of the World” you’ll likely ever hear. Bones’ deep vocals also work quite well on the slow blues of “This Road” before Pena takes back the mic for a non-boozy adaptation of Peetie Wheatstraw‘s “More Good Whiskey” in a heartfelt “Good Love Will Come Back to Me” and a closing “Swing Low Sweet Cadillac” that allows you to hear the deepest registers in Pena’s voice. If you haven’t already gathered, there’s lots to like about this project: in addition to offering up some tight and highly entertaining playing, the respect and admiration these three phenomenal blues talents display for one another is impressive, with Pena at one point acknowledging Bones as “the number one harp player in the Bay area” and Bones returning the compliment by describing Pena as “one of the veterans of the blues…a man that’s synonymous (with the blues) everywhere, and right here especially at the Freight and Salvage.” On behalf of blues fans everywhere, thanks to Bones for helping to keep the music and legacy of Paul Pena alive. Currently, the CD is only available in MP3 form on Big Bones’ (who also performs in a much more funkified fashion under his real name of PJ Norris) website, where you can also find the Giant Killers and Bones’ own So Low CDs. This entry was posted in Albums and tagged Alvin Youngblood Hart, Big Bones, Francis Clay, Paul Pena, Steve Miller Band. Bookmark the permalink.